Old school marketing… with a twist! How do you talk to your clients? As a business we are constantly talking to our clients about their marketing needs, styles, budgets and targets. What this means is that we are a team brimming with ideas and excitement about how to raise the profile of brands, products and businesses. One thing we realised was just how many emails we receive every single day, selling us “stuff” and clogging up our inboxes. When was the last time you received something nice in the post? Probably not that recently. So we have decided to go for an old school approach and send people something that will surprise them, and make them smile. 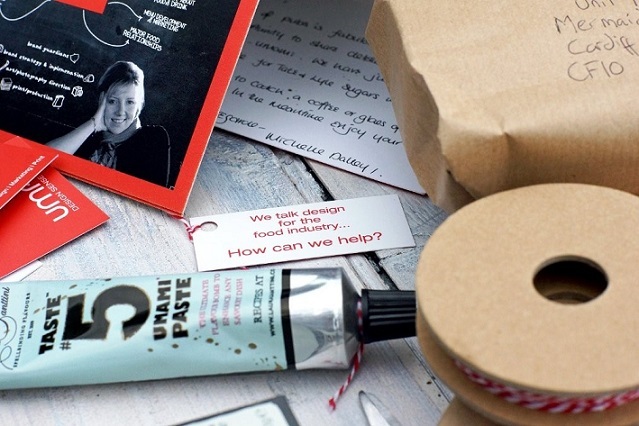 As a result the office has been abuzz with brown paper, scissors, the perfect string (not brown, not thick, lovely brand colours), quality marketing cards and lots of handwriting. The wonderful thing about creativity is that good ideas can grow and grow. However, the balance always has to be measured in the amount you spend. As a team with in-house designers we can create graphics quickly and effectively but then we need to consider how we are going to send the communication out. For our latest campaign, we came up with the idea, worked out the unit price of the components and postage and agreed a total price to spend. This really focussed our minds on sending the mailing to the very best contacts and opportunities. The need to specify a budget in advance doesn’t just apply to direct mail marketing. It is always important to measure the cost against return. Don’t forget to factor in your time too, how long it will really take to write the text and action it… it is never as quick as you expect! For this latest marketing shot we purchased some rather wonderful Taste #5 Umami Paste which is a delicious flavour bomb to enhance savoury dishes. Obviously we chose this product because it works brilliantly with our own company name (Umami) and we hope that the recipients will keep hold of the product because it is unusual, quirky and foodie (they are all food contacts). On that basis we attached a little swing tag with our branding and a chatty message on the neck, so that they remember where to look and find us. The parcel has a personalised hand written card and a business card inside, all wrapped in brown paper with a hand written address. A personal touch like this can make all the difference. Depending on the budget that you have set for your campaign you will then select the contacts that you are going to make. If it is an email marketing campaign you can afford to market to a larger number of contacts at a set price in comparison to direct mail. Social media provides a whole different set of opportunities and something which really needs its own separate blog post, which we’ll get to soon! For direct mail you have to be more targeted. For example, for our current direct mail campaign we chose 20 food industry contacts that we wanted to impress, with a stage two of more contacts to follow. We had a 95% response rate for our original mail-shot, and as a result secured six meetings with big industry players, which goes to show how successful a mail shot can be if it’s well thought out, well targeted and can grab people’s attentions. Make sure you measure, measure, and follow up! All of these contacts are in our CRM, with an action against them and a date to follow up. This is a marketing opportunity: the chance to create a conversation, raise awareness of your brand, encourage the recipient to take a look at your website, share some useful information, share details of your social profiles etc. (wherever you are directing them). People rarely like being sold to; marketing is just the platform that creates the conditions in which people may choose to then buy from you. This is where lots of businesses go wrong. The exciting part can be getting the campaign together, whilst you’re buzzing with ideas. The reality is that we need to follow up on our mailshots to open up the conversation and see what the contact thought. These conversations can then lead to opportunities, maybe not immediately but often further down the line. Remember – a “no” is usually a “no, not now” rather than a “no, not ever”. Talk to your contacts and update your CRM with the next follow up. Celebrate the successes and learn from the feedback.